Well patrons, this week we're meeting up in an old locale that's undergone some modern renovations. As we all adjust our perspective we'll reflect on the slower pace of the past and imagine a future in which we still have to wait around for things. Could a transcontinental network of Game Boy Link Cables have existed if technology had progressed differently? Will a social schism develop along individual preferences for instant or delayed gratification? And how do YOU feel about dollar store items that cost more than a dollar? Consider all this and more as you de Blob your walls with Josh, Emily, Haju... and of course, regulars like you. Well patrons, we did it. 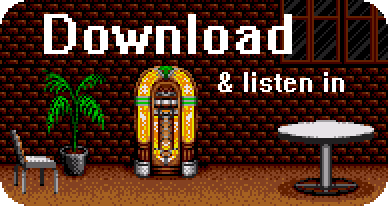 It's been two whole years since The VGM Jukebox podcast hit the airwaves, and it's time to get the whole family together to celebrate. Eat a truckload of candy, spin around for thirty seconds, and enjoy the 100x multiplier as the parade floats roll by. Since this is a super long episode, be sure to pace yourself halfway through by reflecting on the beautiful impermanence of the moment before diving back in for more tunes, tales, and the lengthy conclusion of Reading the Runes. Thank you to everyone for all your support, recommendations, conversations, observations, and felicitations. Congratulations!